The role of urban parks was changing in the late 1800s, and cities throughout the country were designing elaborate urban park systems that included parkways—broad landscaped roadways built expressly for pleasure excursions. Duluth’s developers embraced this new trend, and in 1889 they started creating a parkway perched nearly five hundred feet above Lake Superior. An ancient beach terrace left behind by the meltwater lake that had formed as glaciers retreated thousands of years ago provided a natural pathway across the hillside and gave rise to the first name for the road—the Terrace Parkway. The Herald declared that after driving over the parkway, visitors “were enraptured and could not express their praise in language strong enough for the occasion.” Of course, in 1890 the road provided a spectacular unobstructed view of the city and lake below because the central hillside had been clearcut to make way for businesses, churches, schools, and homes built from the native white pines. The parkway’s construction involved many people, but two men—William K. Rogers and Samuel Frisby Snively—were instrumental. Without Rogers and Snively the parkway would not exist. The idea of a scenic parkway across the hillside came from William K. Rogers, who first arrived in Duluth around 1870 as the new town was being established. Rogers’s plan included more than just a parkway. He envisioned a park system made up of the Terrace Parkway high on the hillside, a stream corridor park at each end (Miller Creek and Chester Creek), and a parkway along the shore of Lake Superior from Chester Creek to the corporate boundary at Fortieth Avenue East. The historical record does not reveal what Rogers accomplished on his own. The park board’s minutes indicate that at the first meeting in April 1889, the members decided to officially start construction of the road on Tenth Street at Lake Avenue, continuing east and west as rapidly as possible. They agreed that work would be carried out “under the personal supervision” of Rogers and that “competent foreman, laborers, and teams” would be employed by the day. Rogers moved quickly, hiring appraisers to determine the value of the land to be purchased and an engineer to lay out the road, as well as renting rooms in the Stenson Block at $38 per month for them to use as offices. Just four months later—in early August 1889—people were using the parkway. Rogers reported to the board, “The road is now for some distance in public use and is evidently appreciated by the citizens of Duluth and visitors to the city.” Work was still underway west of Lake Avenue, where bridges were being built over Buckingham and Coffee (aka Coffey). Creeks and the massive rock outcrops around Seventeenth Avenue West required extra blasting. Duluthians confirmed their support in October when 740 out of 822 voted in favor of selling city bonds to finance the park system. The park board needed that support—at the end of 1889, they calculated that the money spent that year on the Terrace Parkway totaled $5,810.54. Following the successful vote, board members authorized a bond for $312,000, the amount they calculated would be needed to cover the debt and acquire the necessary land. By the end of 1890, with spending exceeding the available funds, city leaders realized the powers of the park board needed to be redefined. 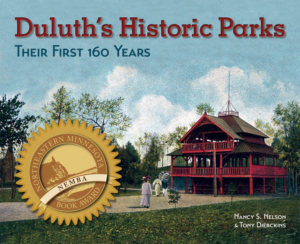 After consulting with other major cities that had a Board of Park Commissioners, the state legislature revised the board’s rules and in April 1891, Mayor Davis appointed new commissioners. Although William K. Rogers remained on the board, he was no longer the driving force. He attended meetings for a few months, then left the board, apparently due to ill health. Responsibility for completing the parkway shifted to the other three prominent businessmen who made up the new board: Luther Mendenhall, Bernard Silberstein, and Henry Helm. The following year they were joined by Arthur Chapin, appointed by the mayor to replace Rogers. Shortly after being appointed in 1891, the new board members began meeting frequently, working to pick up where the previous board had left off, deciding on a more permanent route for the parkway, looking for funds, and establishing operating procedures. They wanted the parkway to be “finished and made safe” by June 1; the date was later pushed back to June 15. They met their goal, but they did not hold a formal opening ceremony to mark the occasion. The road had already been in use for nearly two years, and even as they reached the June 15 deadline, board members continued to make changes to the right-of-way. In their annual report for 1891 they wrote, “At the present time we have a drive that is the pride of our city and one that for its picturesque and varied scenery, is second to none in the world.” They reported that they had spent $25,954.67 to acquire land for the right-of-way, and they calculated that by the end of 1891 the total amount spent on building the road was $102,737.15 (equivalent to at least $3 million in 2016 dollars). Prior to 1894, the road had no official name. The park board referred to it as the Terrace Parkway or the Boulevard Drive. Newspapers called it “the Boulevard.” The Roe Atlas of 1890 labeled the eastern section Lake View Terrace, which included the circle drive around the Grand View Mountain, now the location of Enger Tower. West of the “mountain,” the road was labeled Bay View Terrace. Finally, in December 1894, the park board members unanimously voted to call the road Rogers Boulevard in honor of William K. Rogers, who had died the previous year in his home state of Ohio. The board also created two small lakes on the northeastern side of Grand View Mountain by damming Buckingham Creek. Called Twin Lakes or Gem Lakes (and currently Twin Ponds), the parkway crossed over the creek between the two lakes. The men of the park board at first seemed to view the park system as something that could be “completed.” They intended to purchase the necessary land and build the parkway. However, they soon realized that this would be an ongoing project—that the system would continue to expand and the road would require ongoing maintenance. In 1900 they reported that it had already become necessary to replace the original wooden bridges on the road because “the condition of the old timber structures that had been in use for about ten years had become such as to make them unsafe for further traffic.” In 1903 the old bridge at Fourth Avenue East was replaced—the last of the original wooden bridges.